Rebuild May 17 (following house fire). The Square House sits on Bream Tail farm, a residential enclave in Mangawhai. With majestic coastal and rural vistas, the farm continues to operate and on any given day you may share the road with just a few sheep and an ocean breeze. 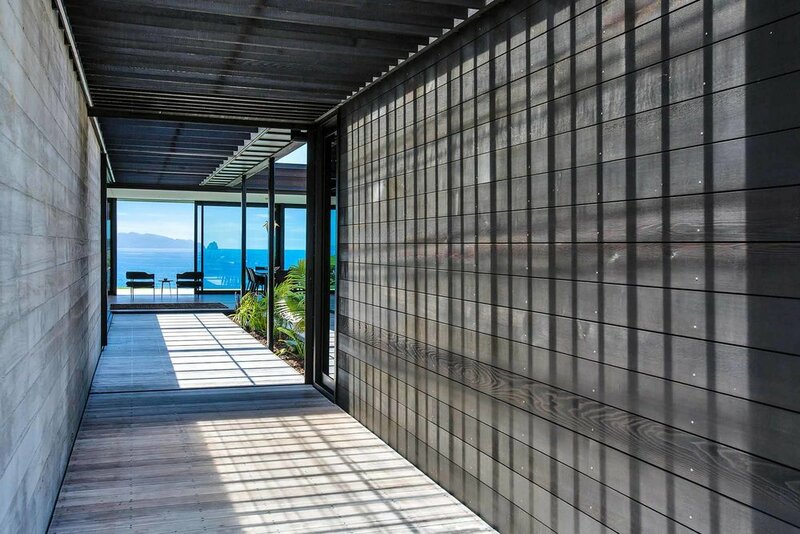 The Square House was designed for simplicity and shelter from the seaward side, without compromising on the view. Having witnessed a neighbour’s home they liked, the owners called on Auckland architects, Studio John Irving, and Atelier Aitken to deliver a practical design with plenty of living space, garaging and a workshop. The single-level building has been arranged around a central courtyard with a glass roofline. On inclement days this area can still be enjoyed, with breathtaking views in most directions. Blending several innovative building products and requiring impeccable workmanship, the Square House is a celebration of minimalism and craftsmanship. Using a striking palette of timber, steel and concrete, the entry is anchored by pre-cast concrete panels with a wood grain finish by Concretec. Custom cedar weatherboard and fascia support this hallway and beckon you into the home. The living area and kitchen spread across the ocean side with expansive joinery, and a beautiful backdrop of rural textures is the outlook for a pair of guest rooms, bathroom, and formal lounge on the north-west side. The master suite has its own quarter, with bespoke bathroom tapware and cabinetry from the owner’s family business. Behind the silhouette of the Square House is a story of devastation and courage to rebuild. A house fire in May 2017 destroyed the original home and placed an emotional toll on its owners. Likewise, for Smith Construction and all associated partners, the rebuild required energy and patience to bring the residence back to its former life. We thank our suppliers and contractors who assisted in this build, not once but twice! ITM Mangawhai, Emerson Electrical, AK Waterproofing, Carter Roofing, Wilson Plumbing, North Glass, Matakana Kitchens, Timber Floor Solutions, Sweeney Painters, Parahaki Engineering, Primo Bathrooms, Altherm Aluminium. Read more about our partnership approach here. “While I would never wish such a distressing event on anyone, the journey to demolish and resurrect the Square House after a fire, has illustrated what our business is capable of. The rebuild took resilience and determination to redeliver to its original bold vision. We couldn’t be prouder of the results. The clean lines, pared-back nature and expansive glass make this one of my favourite builds,” reflects Nick Smith, Smith Construction founder.